Here's a preview of what I have in mind. The roughest prototype ever...of an awning! company, or $480 for an 'install it yourself, diy kit' online. Just the motivation for a DIYer to start scheming a way to DIY! A long time favorite, but the projection is too much for ours. I'd like something a tad more substantial. 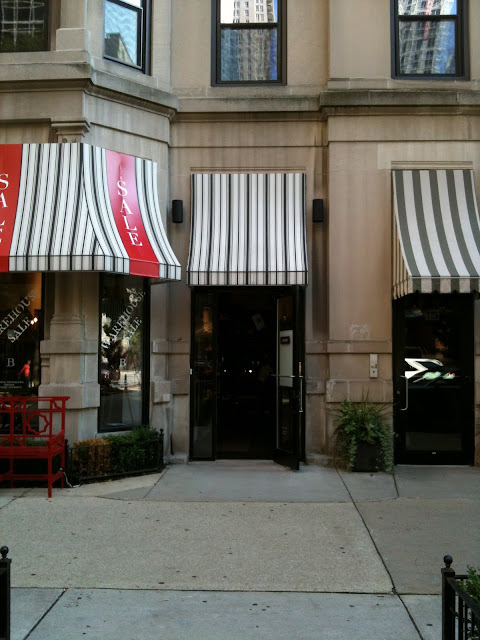 I'd like more of the window visible, in awning terms that's called, less drop. to weld the metal bars that will make the awning frame...stay tuned! The awning is going to look fantastic. 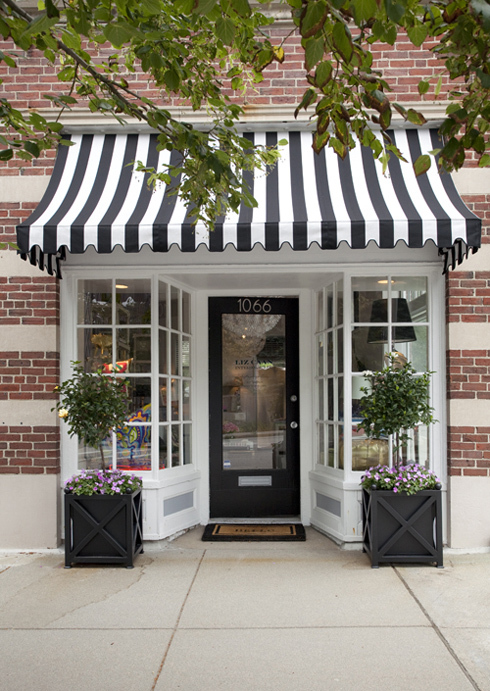 I just love black and white awnings too. I just know its going to look great... please share pictures! ooh i can't wait to see it! the brown cardboard prototype is great! 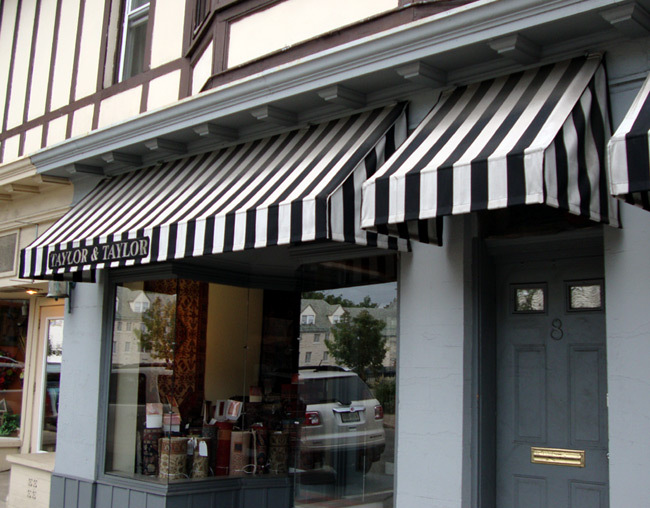 I love awnings and actually just used some of the same photos for my sister-in-law's bakery moodboard. 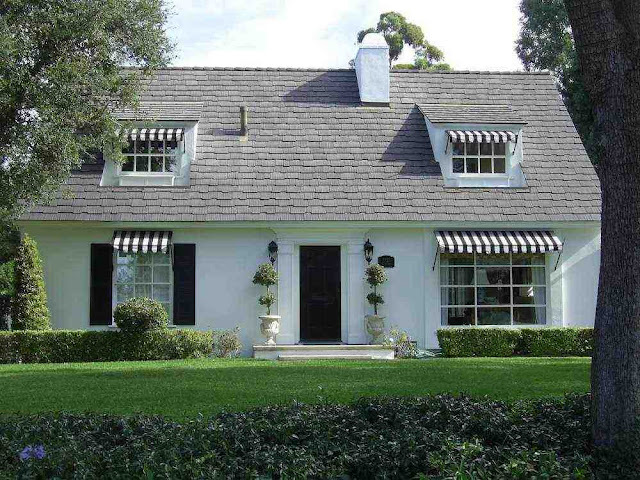 I told her that she really needed those black and white awnings as well. Cana't wait to see yours!!! Love this idea! Cannot believe your ability! I always wanted one over our man door on the garage of this house. 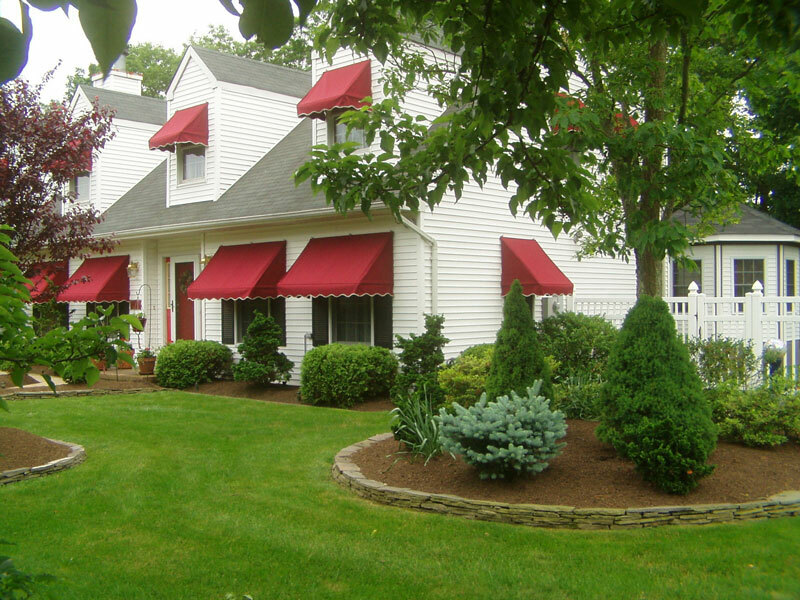 We had extensive awnings made for our last house. A large one over a side deck off our bedroom and a smaller one over a deck to our mudroom. They added so much charm and shade. They were taken off and stored during the winter for snow. Just dropping in for a minute. Had 13 family members stay here last weekend for my mom's bday and house going on MLS today! Okay a DIY awning - you amaze me!! And the welding class? Wow! I want to take that!!!! Can't WAIT to see this one Pam! You are brave to figure this out on the fly. I love the look of it and it will be perfect for your home. Will you leave it up all year long? How awesome, love that you are hiring the neighborhood "welders" to help!!! This is an incredible idea and you are just the girl to pull it off. Smart move pulling in the neighborhood kids too! i can't wait to see this project as i have long admired awnings and just started craving one for my french doors going out of my sunroom to the back deck/patio...i got sticker shock when i started on line shopping and saw the prices! so your DIY might be a big help to me....can i borrow your neighborhood "helpers" when you're finished? (LOL)! This will be FUN to follow! You are so clever to enlist the boys!!! Now to finding the perfect drop! Oh good, I'm glad you didn't give up on your awning dream. It's going to look amazing. Looking forward to all the handiwork to be done! Oh, I love to see your creative little brain at work! Fantastic idea! That is going to add LOADS of charm to your already darling house! Wish we had some talented boys like that around here. Love your prototype. I would have never thought to make something like that. And how awesome to have boys with those skills. We use our neighbor boys for muscle quite often :) Can't wait to see the completed project! I admire your DIY nature! I'd be shelling out the bucks for a manufactured variety - I have no DIY skills. I love the one at the end that you're modeling after. 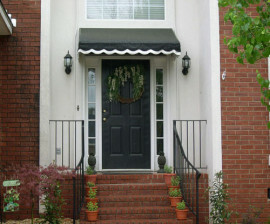 Awnings above doors are so practical for shelter from the rain. I can't wait to see your final product. Love it! Great idea, I can't wait to see how it turns out!! So pretty. I like the less scalloped edge, more tailored look of your prototype than some of the photos. So genius to enlist the boys. Have any of them taken shop?! I need part of a console cut off! Whoa, sounds like a huge project and one I am loving myself! Bethany just got an awning up over her side doors and it is perfect! Love a little relief from rain or weather when opening the door as well as super stylish. Can't wait to see this Pam, best of luck! Love awnings..they add so much character...can't wait to see yours! Love to see what you come up with and how you did it... I need one of those too for my back door to the deck.